Do you have a kid that loves to tinker, invent, and create! I do, and he loves holidays too. For the last few holidays including Christmas, Valentine’s Day, and St. Patrick’s Day, I have made up a tray or basket to use on our various projects throughout the month leading up to the holiday. Our Easter STEM kit in a basket is perfect for the Easter holiday! The purpose of this Easter STEM kit or Easter tinker basket as I like to call it, is to encourage inventing, signing, dreaming, and creating with easy materials for young kids to use. 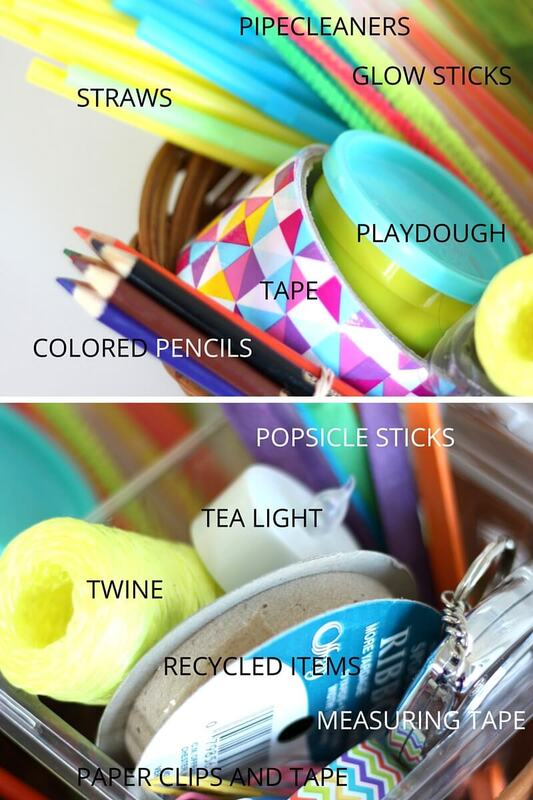 There is no specific plan to the materials in the basket and it is completely open to all ideas, free play, and child led ideas that don’t even have to be Easter themed. I am not instructing or directing, and most of the time I am busy in the kitchen while he tinkers away! We will also use parts of the basket for specific Easter STEM projects along the way. I have highlighted the majority of the supplies included in the basket. My son also has access to scissors and paper should he need or want them. Plus I like to keep a big box of recycling items handy for these projects. You can read more about our STEM On A Budget plan. 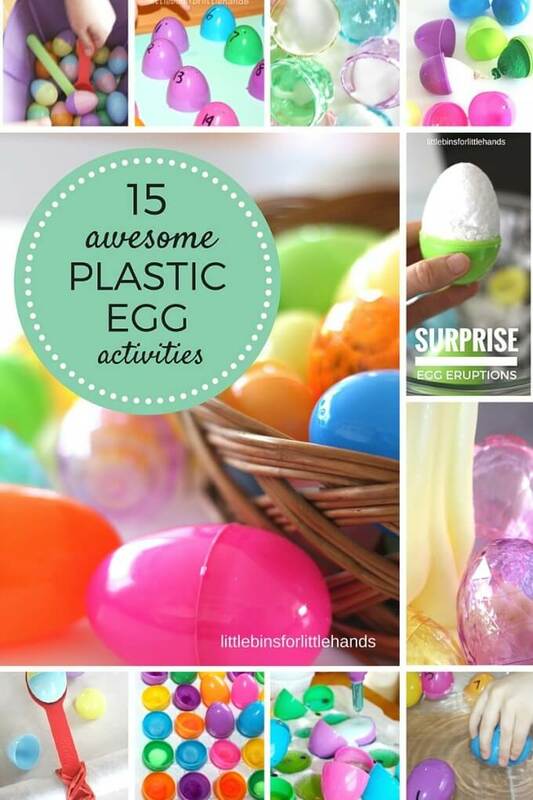 Included is also a large basket of plastic Easter eggs that we have used for so many cool science and play activities. What you put in your Easter STEM kit and tinkering basket is up to you! WHAT CAN YOU DO WITH AN EASTER STEM KIT? Here are a few of our articles that give some great ideas if you need to have some direction with your Easter tinker basket. Again, you can also just have it available for your kids to create with too. Switching up supplies and materials for the seasons and holidays always makes it new and fun for kids! I happily repurpose the unused materials into the next holiday themed tinkering tray or basket, so it is definitely a budget friendly STEM activity. Most items come from the dollar store including the patterned tape! Awesome, because my son can go through a lot of tape in one sitting! 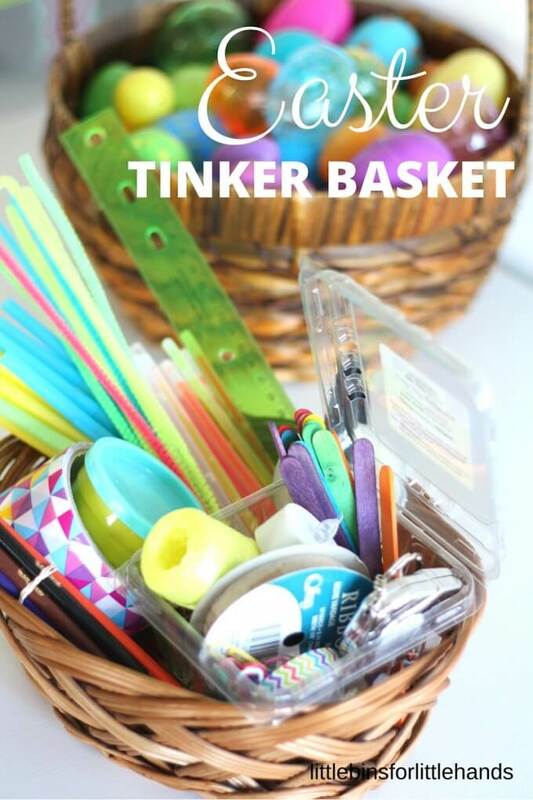 Make an Easter STEM Kit and Tinkering Basket! Thank you for keeping us supplied with STEM ideas throughout the year. I just got to share your Easter Stem Challenges with some administrators touring our school who are not sure how to implement stem. Little Bins For Little Hands was the perfect introduction. I like to supply each classroom with the materials they need to start the fun each month.